Carter Hart making a save during the preseason. Let the Carter Hart era begin. 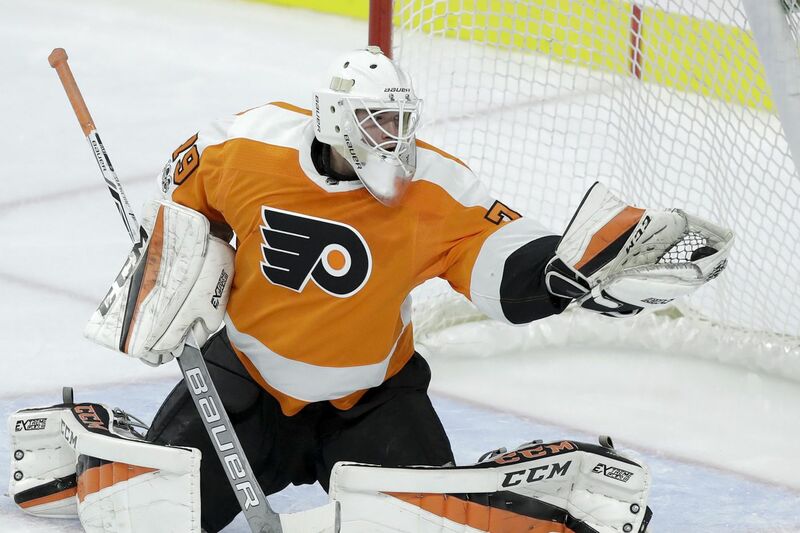 The Flyers called up the much-heralded goaltending prospect from the AHL’s Phantoms on Monday, and he could make his NHL debut Tuesday against visiting Detroit. After a slow start, Hart went 4-1 with a 1.80 goals-against average and .930 save percentage in his last five games. “Just trust in my game,” Hart said about his improved play. "Not trying to overthink plays. Earlier in the year, making the transition from junior to the pro level, I was kind of over-analyzing everything, and I obviously talked to the coaches down there and my goalie coaches back home. I just have to trust my game and play to my strengths." Alex Lyon was sent back to the Phantoms on Monday, and Anthony Stolarz was placed on the injured-reserve list and will be sidelined for two to four weeks, general manager Chuck Fletcher said. Overall, Hart, had a 9-5-2 record with a 3.05 GAA and .901 save percentage for Lehigh Valley. He was a second-round selection (48th overall) in the 2016 draft and was a lights-out performer in the Western Hockey League. Promoting Hart seems to indicate that Brian Elliott will be out much longer than expected with a hip-related injury. Elliott will probably miss several more weeks, Fletcher hinted Monday. Hart and Michal Neuvirth are the goalies on the Flyers' current roster, and one of them will get the call Tuesday. The 6-foot-2, 181-pound Hart smiled and said he wasn’t sure when asked if he was starting Tuesday, but the fact his parents are traveling to the game makes it likely he will get the assignment. Hart will be the sixth goalie to play this season for the Flyers, an unwanted franchise record. According to Elias, the Flyers will become the second team in NHL history to have six goalies play before Christmas. The 2002-03 Blues did it. Fletcher said the fact Phantoms coach Scott Gordon was named the Flyers' interim coach Monday and Hart’s promotion from Lehigh Valley were not related, calling it a coincidence. Hart said he leaned on Gordon as he made the adjustment from the junior level. “He’s an ex-goalie, too, so that obviously helps,” Hart said.